Welcome back to another week of Digital Dozen awesomeness! This month it'll be 5 days of mani's inspirited by different decades. For the 90's I thought grunge would be a good way to go, what do you think? The grunge style originated from the punk rock and heavy metal genre of music and became popular in the early 90's due to bands such as; Nirvana, Pearl Jam, Soundgarden, Alice and Chains being a few. The fashion aspect consisted of ripped jeans, Doc Marten boots, combat boots, band t-shirts, oversized knit sweaters, long and droopy skirts, ripped tights, Birkenstocks, hiking boots and eco-friendly clothing made from recycled textiles or fair trade organize cotton. 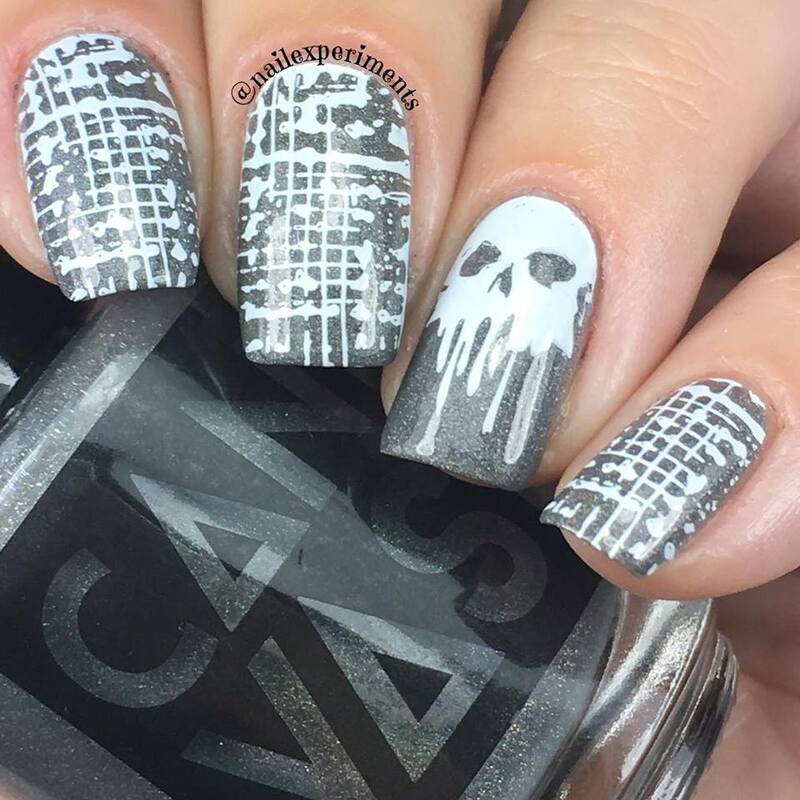 For this grunge rock themed mani, I went with a grey and white pallet and stamped a distressed image paired with a wicked blood drip skull image for the accent nail. Thanks for popping by and feel free to check out the other members awesome mani contributions down below for today's decades prompt. Check back in tomorrow for another decades inspired mani! YAS!!! I love 90's inspired looks! Perfect stamping image choices for the prompt. Yayy! Grunge is the perfect way to go for the 90s! Thanks so much! I love the 90's so flipping much! Ohhhh this is soooo cool! I want that polish and that plate! Thank you! 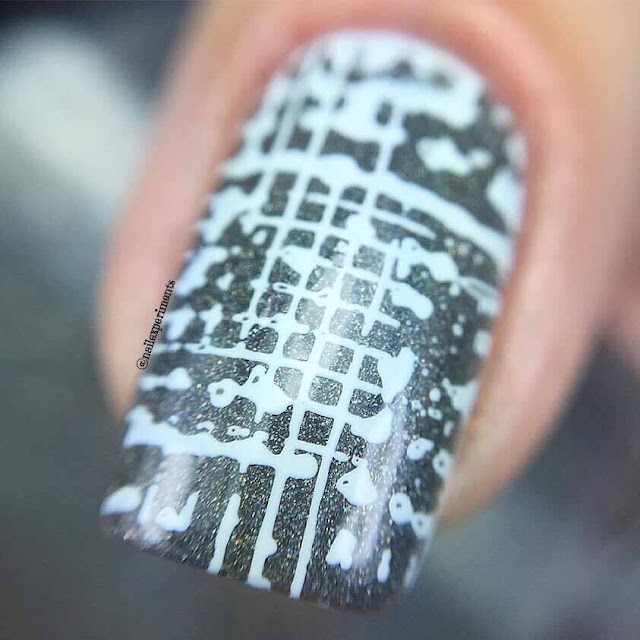 The polish I believe won't be restocked as Canvas Lacquer usually make small batches and once its sold out, it usually doesn't make a return :( The plates though, always available .. love Lina plates so much! Lina plates are amazing! I plan to collect them all. Grunge never looked so good! These are perfect 90s grunge! I want them on my nails. The music of my generation! I lived in Seattle during Pearl Jam, Nirvana days, so they are my jam! :) Love me some PJ....still to this day there are days I put their albums on my iTunes on repeat. Also - I want a T-shirt with your nails design on it. A t-shirt would be pretty cool! That would be something for me to think about getting done in the future! This would make a great grunge tshirt!!! I love it. That base is fabulous too. Well these are super fun! I never even thought about going grunge for a theme and it works perfectly! These are so cool! The base polish you used is gorgeous! This is so 90's rock star! I love it! 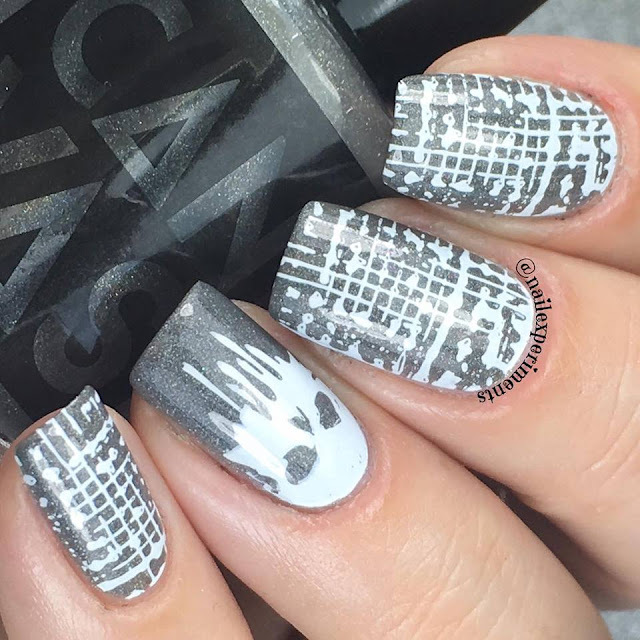 This mani definitely screams 90's to me!